Update, June 10: Totally Accurate Battlegrounds has logged more than three million downloads in just four days on Steam, its developer says. If you’re a fan of battle royale games, Wednesday was a pretty busy day. There was the Realm Royale release, of course – Hi-Rez’s battle royale grew out of a new game mode being developed for their hero shooter, Paladins. But you might have missed another, smaller announcement – Totally Accurate Battlegrounds. There are a lot of them to keep track of nowadays, but which is the best battle royale? The game’s developers, Landfall, actually conceived the physics-based battle royale as an April Fools’ joke, but it looks to have grown far beyond that. In fact, it came in as the 11th most-played game on Steam on Wednesday, with a peak of 20,000 players. That’s more than H1Z1 has managed since March, and more than double the all-time peaks of fellow battle royale games Radical Heights and The Darwin Project. It’s also more than Realm Royale reached Wednesday. Despite the fact that the two games launched at almost exactly the same time, Realm Royale only made it to a peak of 11,522, while TABG made it all the way to 20,000. That’s despite the former coming from a studio with a history of making online games, and the latter literally being a joke. Landfall announced early today that Totally Accurate Battlegrounds has been downloaded more than three million times, and they’ve added a price tag of $4.99 to the game, which was available for free for its first 100 hours. We want to thank everybody who’s been with us so far! We never expected this late April Fools’ game to get more than three million downloads in the span of four days and the reception has been amazing. Those are impressive numbers for any game, let alone an indie title that was meant as an April Fools’ spoof. 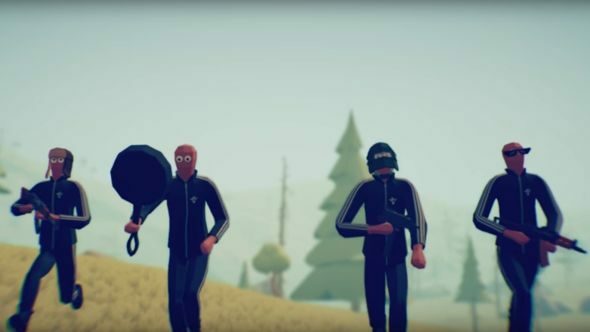 It remains to be seen how well Totally Accurate Battlegrounds does now that it’s no longer free, but whatever happens, it’s already a runaway success.